My last tutorial focused on the creation of a Windows installer for Unity games, now I want to show you two useful tools to create a fancy, customized Mac DMG for your Unity game. But how do you create one of this fancy designed and highly polished Mac DMG files? You can do this from command line as well, but there are handy tools that ease up this process and let you work in a WYSIWYG kind of way. PS: You can convert a .png/.jpeg/.gif into an .ico file easily with one of the bazillion online converters out there, for example ConvertIcon! (clean & ad free). 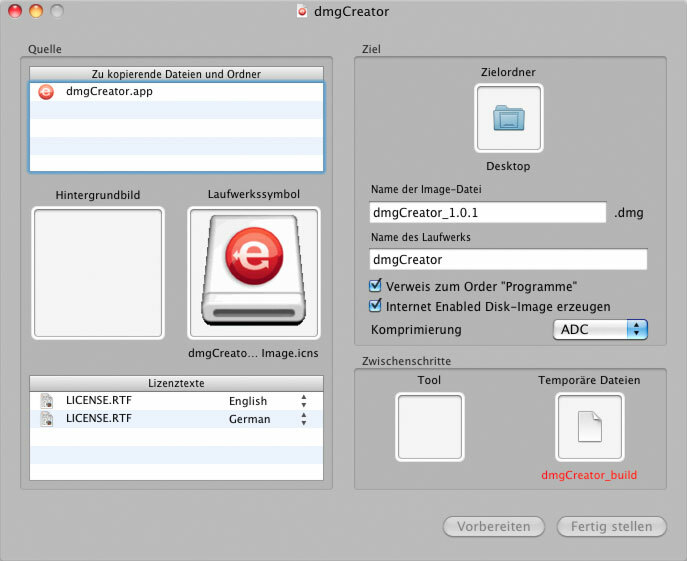 The open source option is dmgCreator and it’s available at SourceForge.net completely free! dmgCreator is a Mac OS X Application which allows simple and easy creation of customized dmg disk images with custom background images. 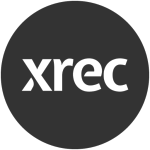 It ensures the correct presentation of the disk image content irrespective of the current Finder configuration. The shareware variant is DMG Canvas, available reasonably priced for 15$. DMG Canvas builds disk images from template documents that you create. Simply design your disk image’s appearance using the graphical editor and click Build. Each time you release a new version of your disk image, simply click Build again and DMG Canvas will pull together all of the latest versions of your files. DMG Canvas also allows you to specify the license agreements displayed when the disk image is mounted, and use localized versions for non-English end users. 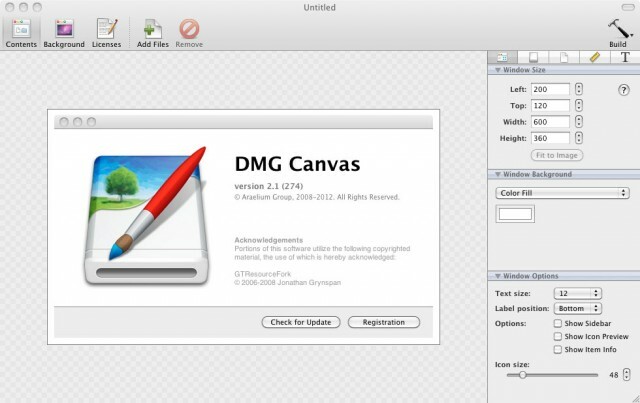 DMG Canvas can do the very same as dmgCreator. However it has some nice extra features like the possibility to change the size of the icons, text tools, help with aligning items and more. It’s also possible to do automated builds using the command line. All in all there are a lot of comfort features and the handling is very good. I didn’t do a real tutorial because I think the apps are full self-explanatory and very easy to use. Just download them, try them out and decide yourself which one suits your needs. If you want to see a nice designed disk image, please go ahead and download the DMG of Of Light & Shadow!